Around the middle of May when I first picked up the Beethoven sonata, I had the idea of jotting down my daily practice in a journal format. I had never done it before and I was curious what the journey would look like when it was traced from beginning to end – end in this case being the piece’s memorisation for practical purposes. The style was simple – I wrote the down my hours of practice and what I played and worked on. If I had goals for the future or ideas that came to me, those went in there as well. It turned out to be a fantastic addition to my routine. Seeing the journey is fun, but it’s also been very helpful to me. Writing it all down forced me to externalise, to document and to think harder about details. It is so helpful to look at memorisation notes, tips, thoughts on interpretation when you have to revisit previously learned pieces after a long time and prepare them for performance. And so, I decided to continue my journaling for all my pieces. Until now, I only wrote in the spare pages of used notebooks since it started out as an experiment. Today, my husband came home with the perfect present – my very own proper piano journal. 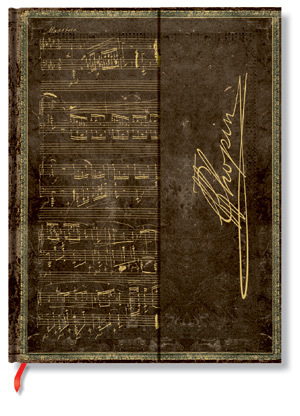 This beauty by Paperblanks is a journal fashioned on Chopin’s manuscript of the Polonaise in A flat major. I love it! It looks amazing (it’s not leather by the way – it’s a paper cover made to look like the old leather books), the writing paper is lovely and it just seems so fitting for a piano journal. I recently learned that Paperblanks has a wonderful collection on embellished manuscript style journal with other composers as well. (More information can be found at their blog here).